Tanghalang Pilipino holds open auditions for the cast of its new children's musical, D’ Emperor, on August 17, 2011 (Wednesday) from 1PM to 10 PM, and on August 18, 2011 (Thursday) from 6PM to 10PM at the Cultural Center of the Philippines, 4th Floor, Bulwagang Pambansang Alagad Ng Sining (CCP Multi-Purpose Hall). 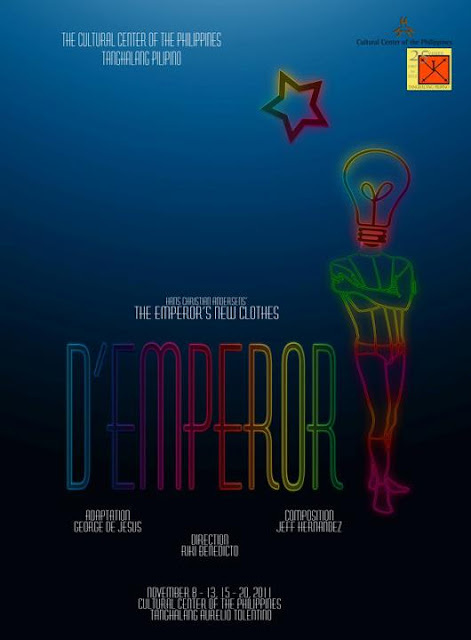 The second production in TP's 25th Theater Season, D’Emperor is a play for children of all ages adapted by George de Jesus III from The Emperor's New Clothes, by Hans Christian Andersen. This adaptation sets the story in the colorful fashion world, with original music by Jeff Hernandez, production design by Tuxqs Rutaquio and costumes by guest fashion designers. The musical features the directorial debut of Riki Benedicto in a major TP season production. It will run at the CCP Tanghalang Aurelio Tolentino in November 2011. They are looking for strong male and female performers, from age 8 to 80, who can sing, dance, act and oozes with X-FACTOR! Those interested to be part of the production are required to perform a POP SONG a la Katy Perry, Bruno Mars, Lady Gaga and the like. Bring your minus one CD or iPod. Come in your MOST FASHIONABLE outfit that will showcase your IDENTITY and Get ready to STRUT DOWN the CATWALK! Send your resume together with 2 pictures (a head shot and a full-body photo) to emperordujour@gmail.com. Upon receiving your email, they will contact you for your Audition Schedule. No email, No audition schedule. For scheduling, inquiries and other details, please call Tanghalang Pilipino at (632) 832-3661 or 832-1125 local 1620 / 1621 or contact the following: Martha Comia +63.917.8440520, Alpha Ruiz +63.917.5553595, Tanghalang Pilipino (632) 832-3661.